Environmental ethics asks about the moral relationships between humans and the world around us. Do we have special duties, obligations, or responsibilities to other species or to nature in general? Do the ethical principles constrain how we use resources or modify our environment? Albert Schweitzer wrote: “True philosophy must start from the most immediate and comprehensive fact of consciousness, and this may be formulated as follows: ‘I am life which wills to live, and I exist in the midst of life which wills to live.’“ Civilization and Ethics, Chapter 21, p.253: reprinted as A. Schweitzer, The Philosophy of Civilization, (Prometheus Books, Buffalo, 1987), Chapter 26. “Silent Spring”, written by Environmental classic Rachel Carson and published in 1962, awakened the public to the threats of pollution and toxic chemicals to humans as well as other species. This book ignited the environmental movements and environmentalism in general. Environmentalism has become well established on the public agenda since the first Earth Day in 1970. Well known first report of the Club of Rome Limits to growth published in 1972 (updated in 2004) demonstrated our physical global role. 1974. Mankind at the Turning Point. Second Report to the Club of Rome describes community problems in understanding of seriousness of environmental problems. UNESCO – continuous development of natural and cultural heritage. Environmentalism took force in 1972 in Stockholm and in 1992 in Rio de Janeiro (World Commission lead by Gro Harlem Bruntland Report, “Our Common Future”, 1987). Now the Registration, Evaluation, Authorization and Restriction of Chemicals (REACH), a European Union Regulation from 18 December 2006, has become a real measure to regulate the so called “chemical climate”, at least in Europe. The leading problem for the wide public is understandig of noosphere, the contemporay status of the biospere evolution. The ecological footstep approach to demonstrate human impact on natural environment and Earth’s carrying capacity including land use, tropical forests, drinking water is a measure of anthropotolerance of natural systems. Ethical principles have high priority in education of sustainable development. A classic starting-point is the the quote from the report by the Bruntland UN Commission of 1987:” Sustainable development is development that meets the needs of the present without compromising the ability of future generations to meet their own needs”. The concept had,however, already been coined in the World Conservation Strategy published by the International Union for the Conservation of Nature, IUCN, in 1980, on which the Commission built. Literally sustainable implies “able to last” and, in this context, on the assumption “last forever”. To „sustain” is to hold, keep up, keep alive. We need not only education for sustainable development, but we need a new approach to the education of sustainable development based on ethical principles and integrated study. We are on the edge of a changing paradigm – the technological optimism. 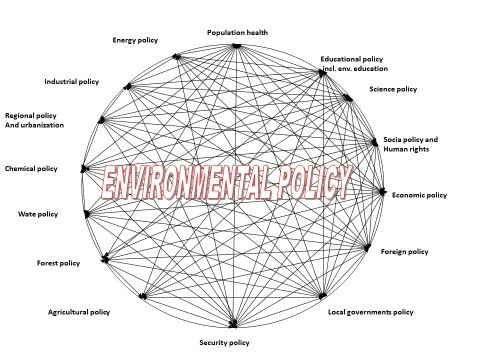 Understanding of complex and integrated environmental policy is the best application of strategic goals in Community development and Biosphere evolution. All these aspects are based on ethical principles and understanding the fundamental value of spiritual resources of the natural and human environment expressed in term “Environmental Policy“.